On June 21, the South Texas Energy & Economic Roundtable (STEER) and the Port of Corpus Christi co-hosted a press conference at the Congressman Solomon P. Ortiz International Center to share some highlights from “Business Opportunities and the New Normal,” the recent study released by The University of Texas at San Antonio (UTSA) Institute for Economic Development’s Center for Community and Business Research on the impact of the Eagle Ford region. 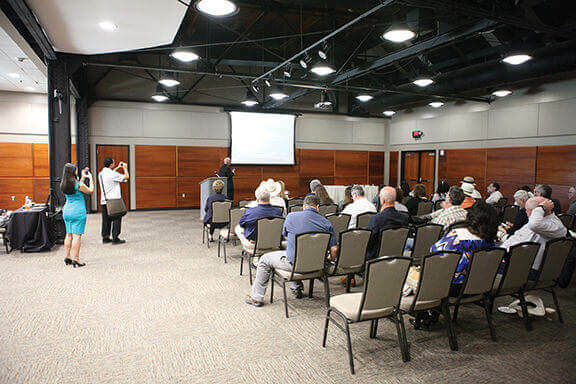 Attendees included members of the press, community leaders, Texas Energy Advocates Coalition members and interested community members. Speakers included Omar Garcia, President and CEO of STEER; Joe McComb, Mayor of Corpus Christi; Jarl Pedersen, Chief Commercial Officer of the Port of Corpus Christi; Wayne Squires, Vice Chair of the Port of Corpus Christi; and Thomas Tunstall, Ph.D., Senior Research Director at the UTSA Institute for Economic Development.